Alterations: in 55 B.C. and 14. B.C. Newly reconstructed, under the name “Basilica Paulli” after a devastating fire; further alterations in the 4th century A.D.
Today it is hard to believe that the ruin on the north side of the present-day excavation site was once the most fascinating and spectacular building of ancient Rome, the Basilica Paulli. The Roman writer Pliny the Elder counted it among the prettiest buildings in the world. The Basilica Paulli was a monumental and richly decorated building centered on a large hall. It stretched along the north side of the Forum and dominated the whole northern area with its towering architecture. The basilica was built in 179 B.C. by M. Fulvius Nobilior. It underwent several modifications and renovations until it was given its final magnificent form (which can still in part be seen today) by M. Aemilius Lepidus Paullus in 14 B.C., under the reign of Augustus. The name of the basilica was changed with a change of proprietor: first it was called the “Basilica Fulvia”, but after 55 B.C., when the family of the Aemilii Paulli acquired the building, it earned the name “Basilica Paulli”. Nowadays it is most often referred to as the “Basilica Aemilia” – but it is far from clear whether this was the ancient name for the building. The sources consistently refer to a “Basilica Paulli” when describing the basilica that was erected / restored by the Aemilii Paulli on the north side of the Forum. Puzzlingly, the name “Basilica Aemilia” is much less frequently used in the literary sources. Perhaps a confusion has arisen about the names (due to the double name of the proprietor family, the gens Aemilia Paulli) and the Basilica Aemilia has been wrongly identified with the Basilica Paulli. 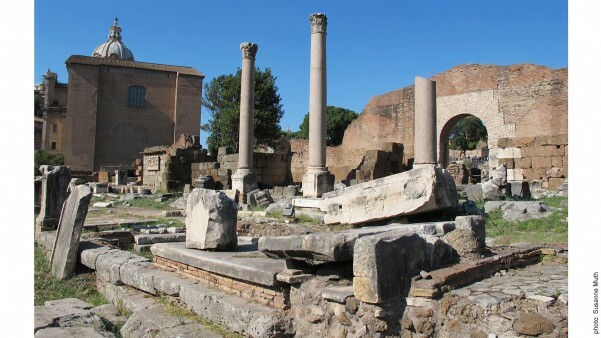 An alternative suggestion is that the Basilica Aemilia mentioned in the literary sources is actually a different basilica on the Forum Romanum and has not yet been located. For this reason, some have proposed a predecessor structure of the Basilica Iulia. The censor M. Fulvius Nobilior ordered in 179 B.C. 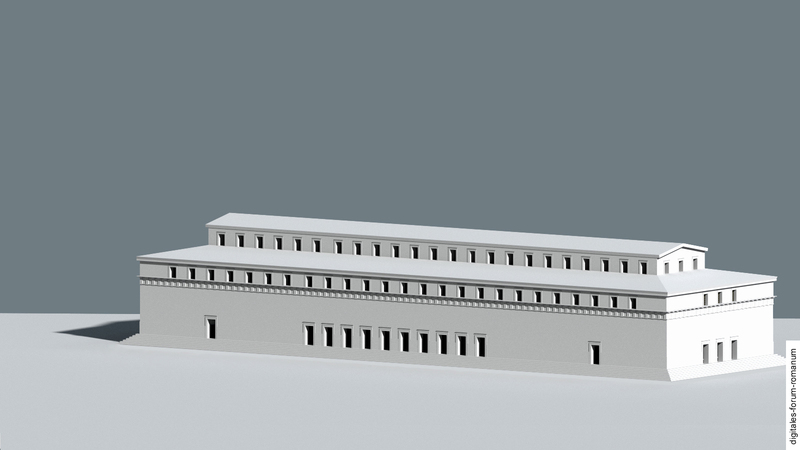 that a monumental basilica be built on the location of the later Basilica Paulli. Perhaps this structure replaced a simpler basilica that had been erected on this area during the transition from the 3rd to the 2nd century B.C., mentioned by the Roman comic poet Plautus. 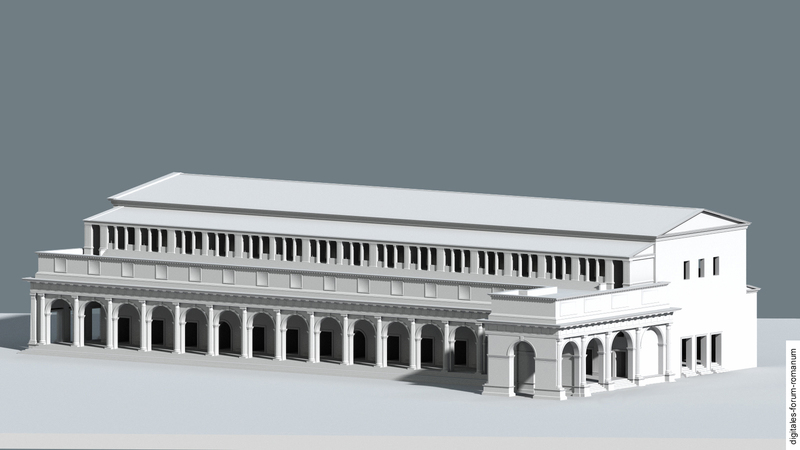 The Basilica Fulvia, together with its unknown possible predecessor, belongs to a group of several spectacular halls that were sequentially erected at the edges of the Forum in the course of the 2nd century B.C. Their facades helped to assimilate Rome’s cityscape to the metropolises of the Greek East and this new standard of glamorous urbanity. 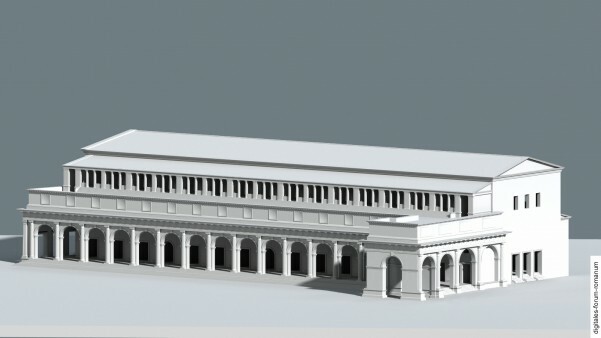 When Caesar was carrying out his construction projects (which affected nearly the whole Forum), L. Aemilius Paullus rebuilt the old Basilica Fulvia from 55 B.C. onwards – of course with Caesar’s financial backing – and renamed it the Basilica Paulli. 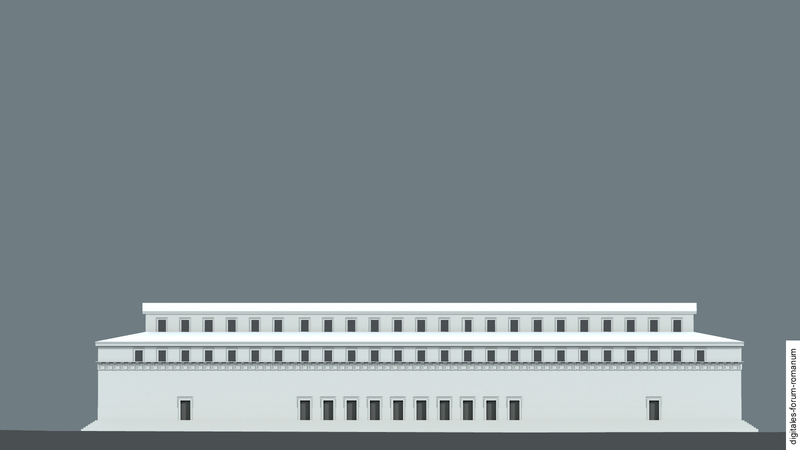 Due to the turmoil of the civil wars in Rome over the next decade, which halted many ambitious construction projects, his son of the same name, L. Aemilius Paullus, was only able to inaugurate the renovated structure in 34 B.C. After a fire in 14 B.C., the Basilica Paulli had to be restored once again. This was done in the name of M. Aemilius Lepidus Paullus, a descendant of the Paulli family, but was de facto financed by Augustus and his followers. Both a fire during the reign of Emperor Carinus in 283 A.D. and multiple fires during the raids of the Visigoths in 410 A.D. caused heavy damages to the basilica. The basilica was restored again and again, remaining in (partial) use up until Late Antiquity (for the individual phases, see below). 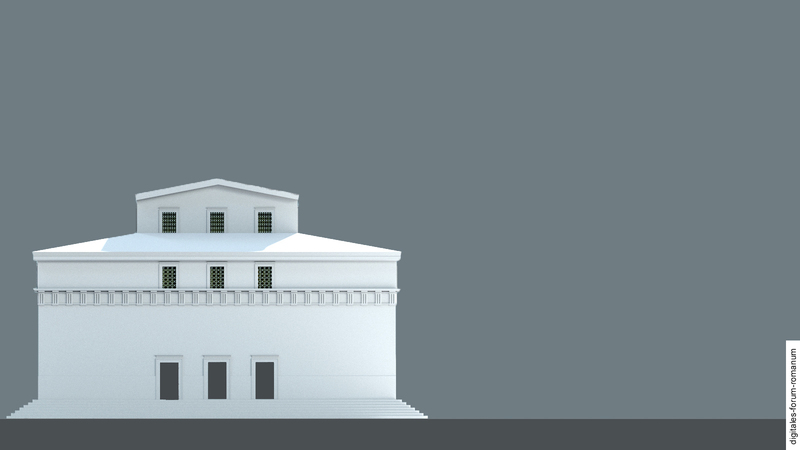 In general, the buildings known as “basilicae” were multifunctional. As evidenced primarily by literary sources, a basilica was a building in which commercial transactions (transfer and exchange of money) and civil court proceedings took place. Depending on the occasion, e.g. 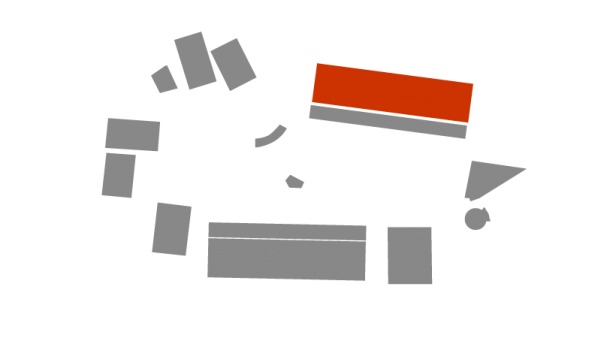 court trials (several of which proceeded simultaneously), a designated area could be separated from the rest of the interior by wooden barriers or other constructions that do not survive archaeologically. Because the structure was subdivided into numerous aisles and supported by columns, it was extremely well suited to various uses. Because the Basilica Paulli was a well frequented building due to its various functions and central location, it also served as a place of political representation. While the Aemilii Paulli had used the basilica for their own purposes during the Republic, the Princeps and his family made use of the building starting in the late Republic and increasingly into the early Imperial Period. It is especially striking that the entire building was faced with marble, providing a facade that accorded well with numerous other construction projects of the Augustan era. This type of construction prompted Suetonius to famously remark that Augustus had begun his rule over a city made of bricks and ended it with a city made of marble. Scholars have developed opposing views about the number of construction phases and their dating. This is due to not only the difficulties surrounding the different names for the building in ancient texts, but also the innumerable constructional activities undertaken by various L. Aemilii Paulli which have been interpreted differently. The excavations at the beginning of the 19th century were unable to yield any definite results about the temporal development of the structure, especially as they (like the subsequent excavations) remain unpublished. Between 1922 and 1940 some areas were reconstructed, such as the row of tabernae in front of the basilica and the common wall which separated the shops from the basilica. This part of the basilica is the best preserved part and it can still be seen today. 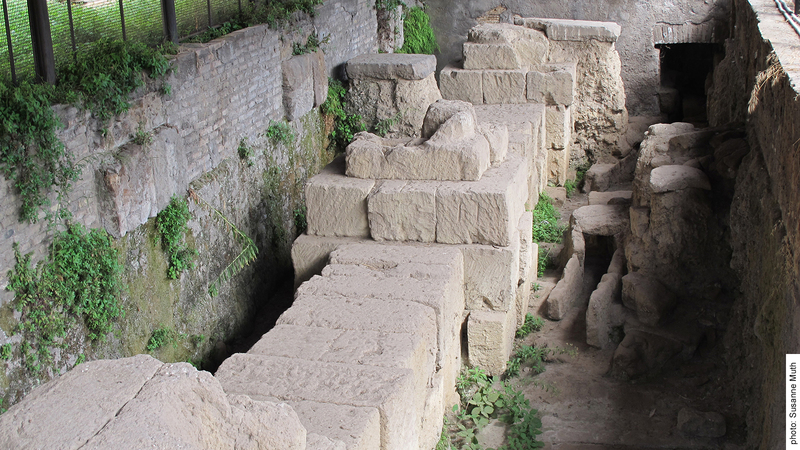 The column fragments found in that area have been reassembled in their original position and give us an impression of the scale and inner structure of the basilica (for images of the present-day ruins, see below). 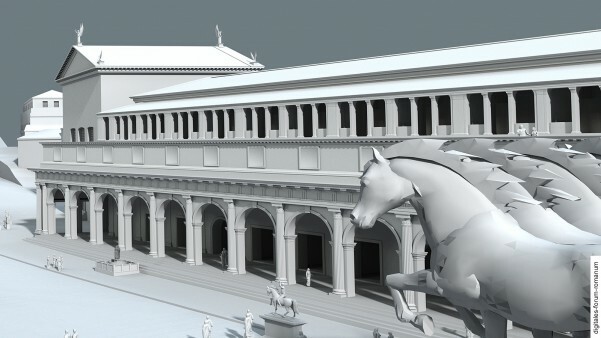 Investigations into the area around the Basilica Paulli so far have resulted in controversies about the exact location of decorative elements within the structure, such as statues of eastern barbarians and a relief cycle depicting scenes of Rome’s mythical past. 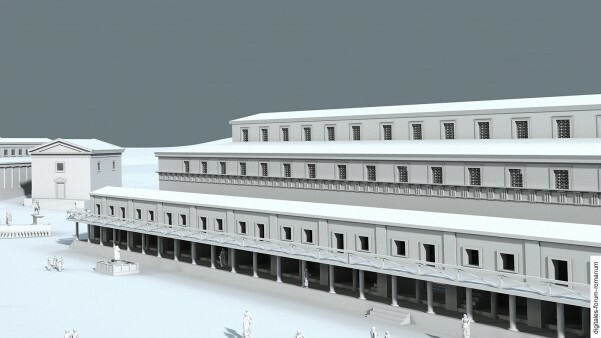 Researchers at the German Archaeological Institute are trying to develop a better understanding of the diachronic evolution of the Basilica Paulli based on a new visualisation of the building and a close inspection of the remains. The first building that is safely documented, the Basilica Fulvia, was inaugurated – according to literary sources – by the censor M. Fulvius Nobilior in 179 B.C. 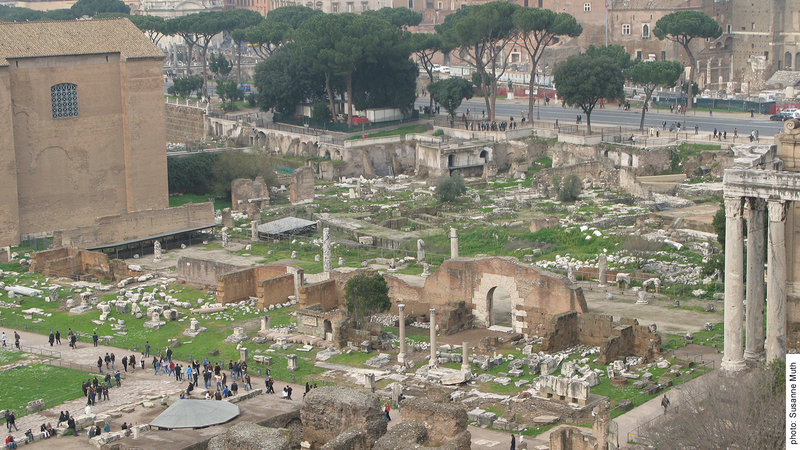 The Roman comic poet Plautus mentions an earlier basilica that was apparently built after a fire in 210 B.C. and is identified as the successor building to a structure called the “Atrium Regium”. The function and dating of this Atrium Regium, which clearly gave its name to the subsequent basilicas (lat. atrium regium = gr. αὐλή βασιλική), is the subject of heated discussion. However, there is very good evidence that it served as the administrative centre of the Roman magistrates in the later part of the 3rd century B.C. At that time, Rome, an expanding world power, lacked impressive buildings on the Forum that could do justice to Rome’s extraordinary power in foreign affairs and serve to host foreign legates. 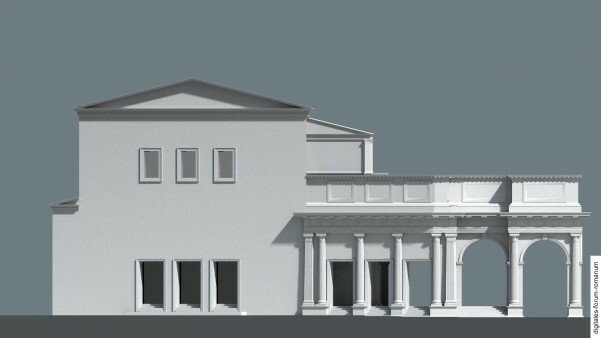 Thus the Hellenistic audience hall was transferred from the Greek East to Rome, a basic form of architecture now adapted to Roman political requirements. This new and genuinely Roman type of building, the basilica, had functionally as well as nominally developed from the Atrium Regium – and a clear continuity in usage can be attested with the Atrium Regium, especially in the case of the basilica on the north side of the Forum. 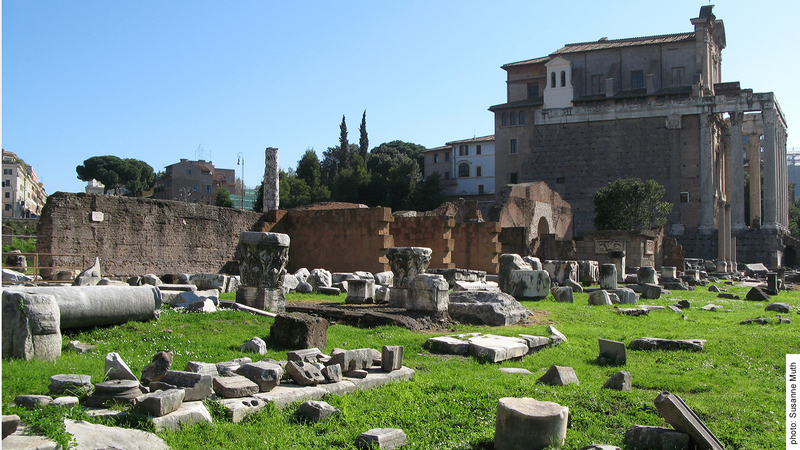 A small portion of the architectural remains in the area of the Basilica Paulli has been excavated. However, it remains unclear whether the remains should be attributed to the structure of 179 B.C. or to the preceding phase in 210 B.C. Still, a rough sketch of the Basilica Fulvia can be developed on this basis. The building probably had three aisles and two storeys, was conjoined with several shops on the south side (either called tabernae argentariae, “shops of the moneychangers,” or tabernae novae). The porticus in front of the tabernae was located 3 m north of the porticus of the later Augustan structure. The ground level was about 1,5 m lower. Tuff and travertine were the materials used for the upper architecture. The foundations under the exterior columns facing the Curia have survived on the west side of the basilica and remain visible at the excavation site today. In the early 1st century B.C. the basilica was nearly entirely rebuilt. 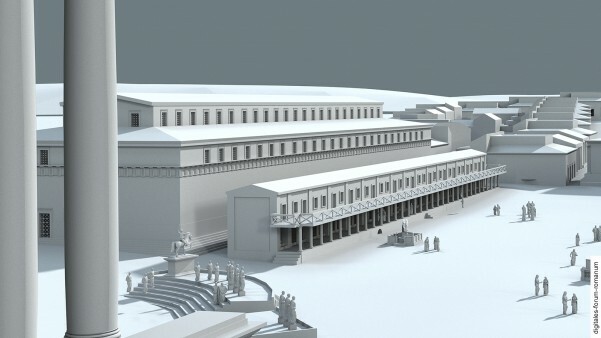 The shops on the south side, however, remained, because they were not structurally linked to the actual basilica but constituted an autonomous complex that stood in front of it. Shortly after the basilica was inaugurated in 34 B.C. it burned down again in 14 B.C. Due to the close succession of both phases, it is not always easy to distinguish the material finds of the Caesarian phase from those of the Augustan phase. 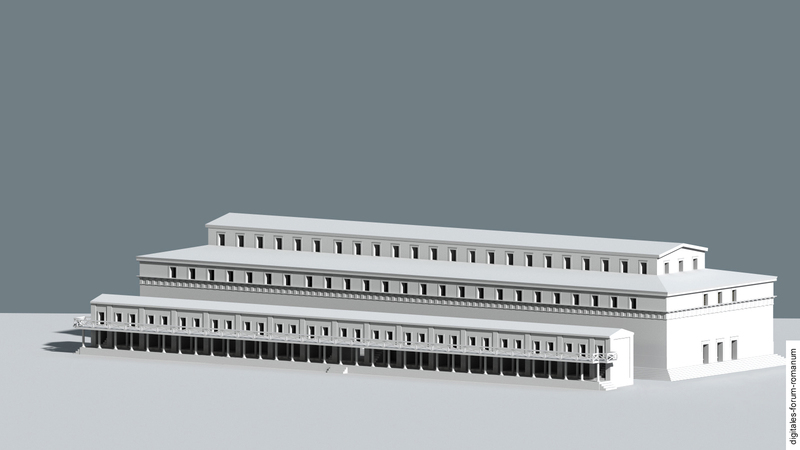 However, the building from the early Caesarian phase likely had an overall appearance similar to the Augustan structure; thus it is plausible that the basilica building had four aisles and two storeys (cf. phase 3, Augustan Basilica Paulli). The most important innovation in the Caesarian phase were big pillars with half-columns standing in front of them. This generated arcades connected to each other through arches. On top of them there must have been a clerestory that served as a viewing platform overlooking the Forum. 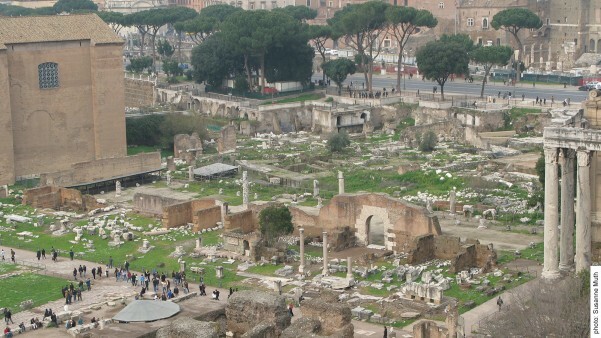 From here observers could marvel at, e.g., festivals, processions and gladiatorial fights, which Caesar repeatedly organised in the Forum Romanum. After a devastating fire in 14 B.C., the Basilica Paulli was rebuilt under Augustus. Officially this went under the name of M. Aemilius Lepidius Paullus, but it was financed by Augustus himself. 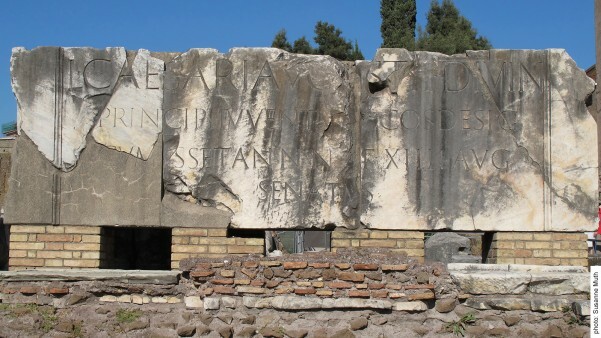 An inscription refers to the construction of a porticus by Augustus’ adoptive son, Lucius Caesar, and probably also by his brother Gaius Caesar (so-called Porticus Gai et Luci). It thus directly points to the inner circle of the Princeps. Because Augustus was adamant about representing his designated heirs on the Forum as well, the deeds of other aristocrats, such as the Aemilii Paulli, were marginalized; priority was given to the benefactions of the Julio-Claudian dynasty (see also Augustan II). The inscription was probably attached to the arch that spanned the northern Forum road from the south-east corner of the basilica. This arch constituted an architectural unit together with the Porticus Gai et Luci, inaugurated by the Senate in 3/2 B.C. in honour of the two young heirs to the throne (who died in childhood). 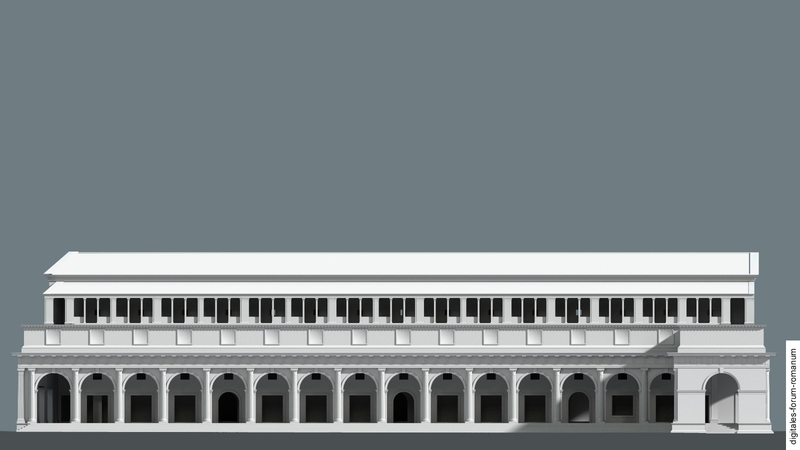 It is identical with the porticus in front of the Basilica Paulli. 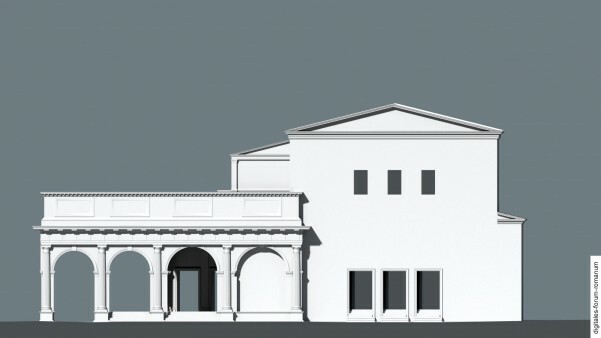 This porticus was orientated towards the Forum and exhibited a richly decorated facade of Doric, Tuscan and Ionic elements. Just like its Caesarian predecessor, a monumental terrace was situated above the porticus and the shops. The spectacular marble decoration of the exterior extended to the interior as well. The floor of the middle aisle was adorned with costly coloured marble, while the floor of the side aisles was covered with white marble. The lower storey of the interior had Ionic capitals, the upper Corinthian. The northern area of the basilica was extended (date uncertain) and so the whole building was transformed from a structure with three aisles into one with four. Scholars long assumed that restorations took place after the raids of the Visigoths under Alarich in Rome 410 A.D. This was supposed on the basis of an inscription honouring the Emperors Honorius and Arcadius from the years 418-420 and referring to the restoration of the porticus located in front of the basilica by the city prefect Symmachus. Accordingly, the Basilica Paulli was understood as a textbook example of the destruction of Rome by the Visigoths. The restorations of the porticus evident in the the archaeoloigcal record, including a closer positioning of the pillars (in apparent contrast to the facade of the Augustan structure), was thus interpreted as a desperate act to conceal the ruin that lay behind the porticus. However, recent inquiries have shown that the basilica and the porticus in front of it were in fact already modified and renewed in the first half of the 4th century A.D., long before the Visigoths plundered Rome. 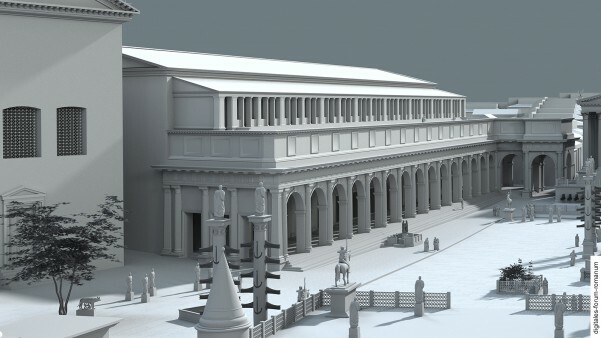 At that time, many of the parts of the basilica from the Imperial Period were reused and other parts were replaced with bricks; thus the basilica retained the scale and appearance of the Augustan phase. These restoration measures in the Basilica Paulli can be placed within a larger context of structural change in the Forum in the 4th century A.D. and sought to give the Forum a unified appearance. 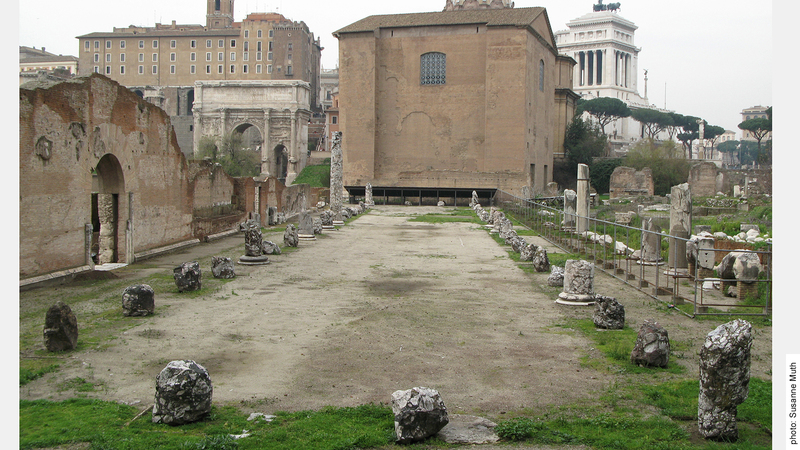 So began the last chapter in the history of the Forum’s spectacular architecture (see Late Antiquity I). H. Bauer, Basilica Fulvia, in: E.M. Steinby (ed. ), Lexicon Topographicum Urbis Romae I (Rome 1993) 173-175. F. Coarelli, Il Foro Romano II. Periodo repubblicano e augusteo (Rome 1985) 201-209. E. M. Steinby, Basilica Aemilia, in: E.M. Steinby (ed. ), Lexicon Topographicum Urbis Romae I (Rome 1993) 167-168.